Recording under the name Ambientportal DJ/Synthesist Mykl Neufeld realizes complex and nuanced sonic renderings from the treasury of his mind. 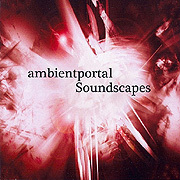 The idea of atmosphere is the seed from which his album Soundscapes (45'00) has grown. A continuously flowing piece in seven parts, this quality work of Ambient/Spacemusic expands gently through an interesting range of sculpted textures and sustained moods. With its long stretches of churning consonant tonal combinations and slowly sweeping digital wind, the energy level on Soundscapes drifts, slips and lifts in a sweet dream-like freedom. The experience is made deeper as here and there the composer drops in acoustic samples, computer grit and languid rhythmic blipping pops. Believing that randomness is full of patterns, Ambientportal engages intuition over intellect to its fullest. His musical alchemy yields a journey inward as intriguing as the journey outward.